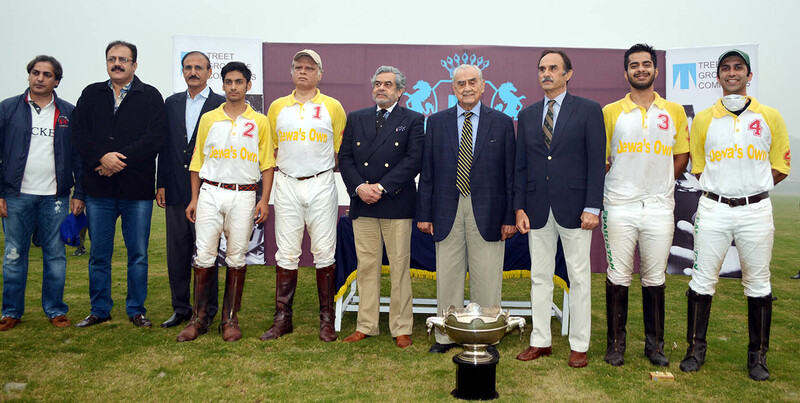 LPC – LAHORE: Five-star Saqib Khan Khakwani steered Dewa’s Own to tremendous 11-5 triumph over struggling Remington Polo in the Treet Polo Cup 2017 final to clinch the coveted trophy here at the Lahore Polo Club (LPC) ground on smogy Sunday. Saqib Khakwani, playing fearless polo and defying huge smog and tough resistance from the rival side, fired fabulous five goals to steer his team to title victory. Mumtaz Abbas Niazi (3 goals), Emran Akhtar (2 goals) and Mian Mustafa Aziz (1 goal) completed the tally for the victors. From Remington Polo, Bilal Haye struck four and Bilal Hayat Noon one. The final started on a high pace, as both the teams attacked each other’s goals one after another and succeeded in converting two goals each in the early part of the first chukker. Saqib scored a brace for Dewa’s Own and Bilal Haye and Bilal Noon converted one goal apiece. In the dying moments of the first chukker, Dewa’s Own players changed the gears and pumped in two goals to give their team 4-2 lead. The second chukker was evenly poised as both the sides scored two goals each to make it 6-4. Mumtaz Abbas Niazi (2 goals) were scorer from the winning side while Bilal Haye struck twice for the losing side. Dewa’s Own continued their dominance in the third chukker as well as they added two more – one each by Mumtaz Abbas and Emran Akhtar – to take 8-4 lead which was reduce to 8-5 by Bilal Haye who converted spot penalty successfully. The fourth and last chukker was fully dominated by Dewa’s Own, who hammered hat-trick through Saqib (2 goals) and Mian Mustafa Aziz (1 goal), to finish the final having 11-5 lead. Earlier in the subsidiary final, Dawood Group edged past Terra Energy by 4½-3. Mohsin Atta Khan Khosa played sublime polo and hammered all the four goals for Dawood Group, which had half goal handicap advantage. From Terra Energy, Ahmed Bilal Riaz scored a brace while Haris Haroon Malik hit one. Packages chairman Syed Babar Ali graced the final as chief guest while Treet Group of Companies CEO Syed Shahid Ali was guest of honour. Lahore Polo Club president Irfan Ali Hyder, executive committee members Umar Sadiq, Ahmed Nawaz Tiwana, secretary Col (r) Shoaib Aftab and a great number of polo enthusiast and players’ families were also present on the occasion. In the end, the chief guests gave away trophies and souvenirs to the winners and top performers.